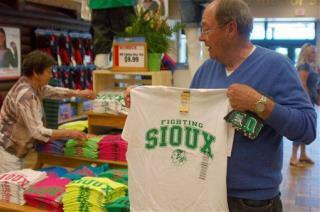 (Newser) – Voters have had their say in the long fight over the University of North Dakota's Fighting Sioux nickname, and 60% of them voted in favor of allowing the university to drop the name. The state's Board of Higher Education is now expected to retire the controversial name and American Indian head logo, which brought sanctions from the NCAA—and led to a state law requiring the university to keep the nickname. if anything lets get rid of the atlanta braves and that damn chant! And taking the ice :the fight slot machines! All in All this is all pretty ridiculous, They should be proud that their name is being promoted. But they should also get a cut of all merchandising and advertising related with their tribe names. I think that they would actually welcome that.